Residents near the proposed new Aurora United Church redevelopment plan are urging council to keep the heritage feel of the streets. Recently, the church presented plans to rebuild the church that burned down in 2014 on the same site — at Yonge and Tyler streets. 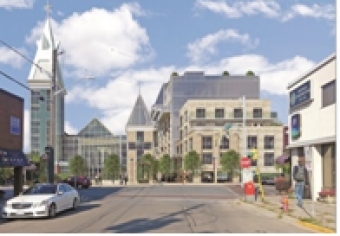 The plan also includes building a 9-storey retirement residence along Tyler and Temperance streets, which requires the demolition of five properties. The five buildings on the site — 12 and 16 Tyler Street, 55, 57 and 57A Temperance Street — are on the town’s heritage and cultural registrar.